For the eighth time, people from the VideoLAN community will meet to gather, work, discuss and build a stronger community in Berlin. For the seventh time, people from the VideoLAN community will meet to gather, work, discuss and build a stronger community in Paris, France. For the sixth time, people from the VideoLAN community will meet to gather, work, discuss and build a stronger community. For the first time outside Paris, in Dublin, Ireland. For the fifth time, people from the VideoLAN community will meet in Paris to gather, work, discuss and build a stronger community. 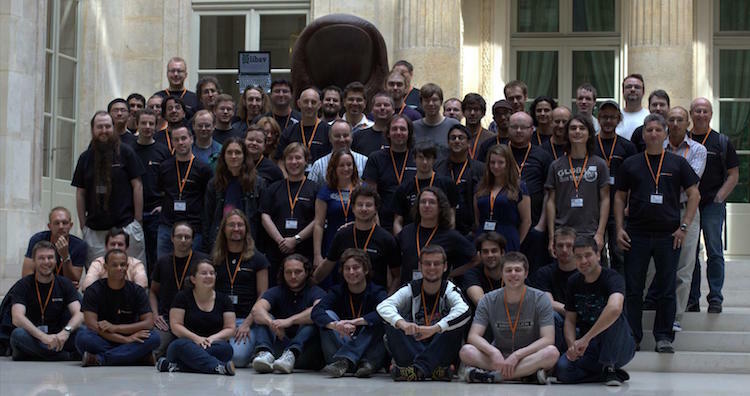 For the fourth time, people from the VideoLAN community will meet in Paris to gather, work, discuss and build a stronger community. For the third time, people from the VideoLAN community will meet in Paris to gather, work, discuss and build a stronger community. For the second time, people from the VideoLAN community will meet in Paris to gather, work, discuss and build a stronger community. The VideoLAN community is a fast-evolving and ever-changing community and development happens really fast. While this is fun, it is always difficult to meet and discuss with each other in person. Once again, a few of us attended FOSDEM this year. We didn't hold any presentation but it was a nice occasion for us developers to meet in real life and to discuss about VideoLAN future, especially the migration from SVN to GIT and the release of VLC 0.9. From left to right: ivoire, LeJo, phytos, jpountz, jb, JPeg, jpsaman, dionoea and Remiii. Here you can find other photos of the VideoLAN team at this event thanks to ivoire and phytos. VideoLAN will attend the Solutions Linux expo in Paris. This year, we'll have a booth in the free associations area. Don't forget to drop by! Like last year we again attended FOSDEM. And this year we were HOT. People flocked around our demo's. There were several multicasted streams and the 7 laptops all did something different with them. Rotating OpenGL transparent cube shown in a transparent output window running on Mac OS X. Next to it Colored ASCII Art output with a text (marquee) and a logo filter running on FreeBSD. On the left you see the VLC mosaic (picture in picture) filter showing a one movie transparent on within another movie and a textfilter. You also see the Wall filter showing how you can split up a movie into pieces on different monitors. It also shows the time and logo filters, as well as positioning of the text filter and uses caca output on a quarter of the wall. Zorglub held a short presentation of VLC, you can download it (OpenOffice format) if you want and there are pictures here. More photos: Geeks, Misc, Walls, General Views, Other demo, Short night, The end. There are also some shots made by other FOSDEM attendees. They were pulled from the FOSDEM picture site. Copyright to the respective creators of the pictures, redistribution is not allowed. These files are for our own personal archive. The VideoLAN team was represented by: zorglub, courmisch, yoann, dionoea, adn, thedj, bigben, jpsaman and fox. Niv Altivanik, Ruud Stelt and Peter and friend accompanied us frequently during FOSDEM and especially on saturday evening. Like every year, the VideoLAN team had a booth at Solutions Linux Paris with colorful demos and a lot of visitors ! On February 26, TechTV aired a small piece on VLC media player, showing of it's powerful DVD streaming capabilities. So a few of us attended FOSDEM this year. We had a small booth with several laptops showing multicasted video's like "The Animatrix". Present were: Fox, sam, bigben, thedj, alexis, murray and jpsaman. Chris was our host in Brussels and goon also dropped in. Jean-Paul Saman held a short VideoLAN presentation highlighting its history, present and future developments. The presentation in OpenOffice format is here and a PDF version is here. Arnaud Limbourgh made a small movie of our booth with the demo setup. Some more pictures made by FOSDEM attendees are gathered here. They were pulled from the FOSDEM picture site. Copyright to the respective creators of the pictures, redistribution is not allowed. These files are for our own personal archive. VLC 0.5.3 is runner up (i.e. 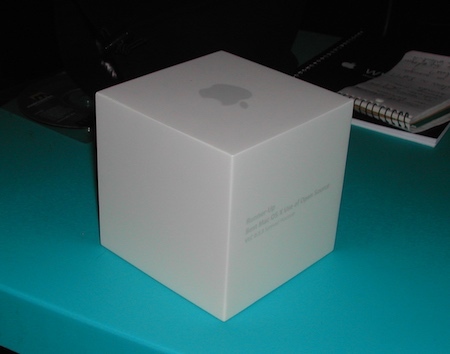 second) for Apple Design Award 2003. Colin Delacroix and Mathieu Poumeyrol where there at the Worldwide Developers Conference in San Francisco and are taking the trophy back! 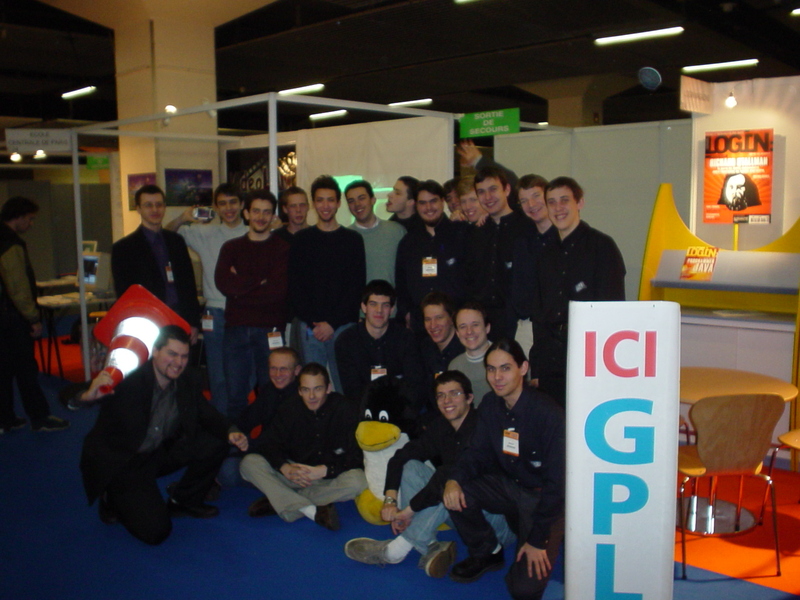 The VIA and VideoLAN teams organized a presentation of their activity and they projects for the future to their partners and all the companies and institutions interested on March 21th 2003 at the École Centrale Paris. Like every year, the VideoLAN team had a booth at Linux Expo Paris with colorful demos and a lot of visitors ! This year, we had specials guests : our core Norvegian developer, Jon Lech Johansen (i.e. "jlj"), came with his father for the Expo to meet the French team and to visit Paris ! 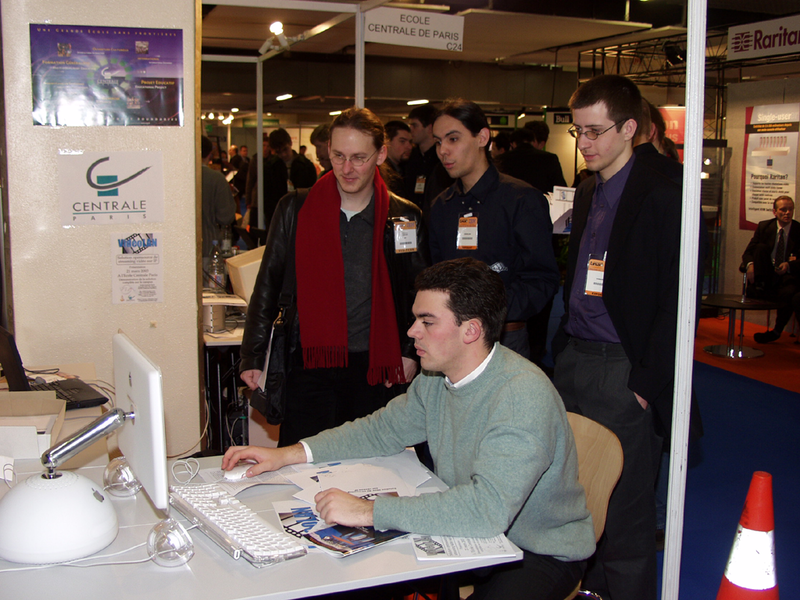 In the foreground: Damien Lucas (alias nitrox) in front of the imac kindly lended by Apple for the expo ; in the background, from left to right: an anonymous visitor, Jean Sreng (alias fox) and Jon Lech Johansen (alias jlj). VideoLAN was present at the Free Software Days (Journées du Libre) in Lyons (Lyon), France: we had a stand with a running demo of VideoLAN and we made a conference presenting VideoLAN with the first public demo of VLC as a plug-in for Mozilla under Linux! This event was organized by our friends of ALDIL. Our favorite dutch developer, Jean-Paul Saman, who works on the iPak port of VLC and on VLS, came to Paris and visited the French team on this occasion! 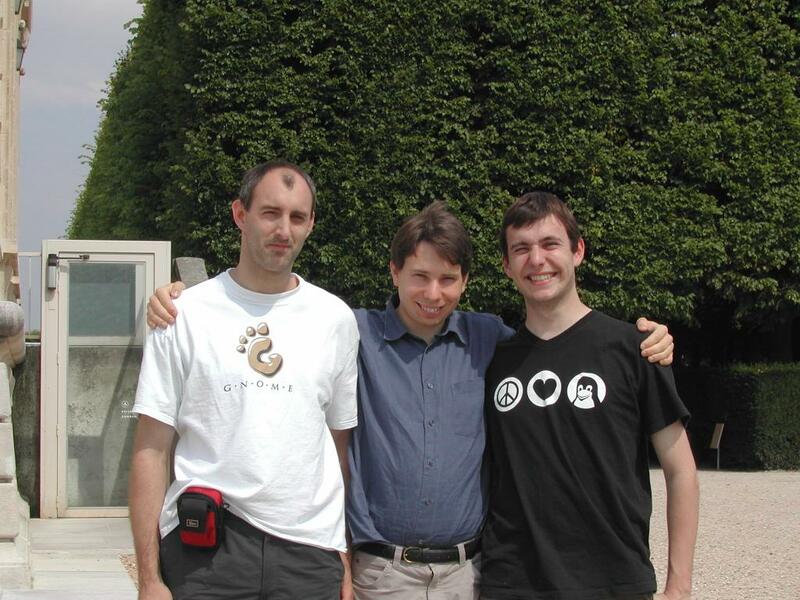 From left to right: Jean-Paul Saman, Christophe Massiot (alias Meuuh) and Tristan Leteurtre (alias tooney). Picture taken in the beautiful Sceaux Park by the new mascot of our IRC channel, Aliénor Salin (alias ali). VIA Centrale Réseaux, the association which manages the network of the student residence of the Ecole Centrale Paris, has set up a brand new network from Extreme Networks. It is a full multicast and full layer 3 network with a multi Ethernet Gigabit backbone and 100 Mbit/s switches on the periphery. The VideoLAN team has launched a new test campaign on this network. One thousand students take part in the test campaign. They can choose to view one of the 12 channels and switch from one to another instantly. For the first day of the test campaign, we organised a show at the Ecole Centrale for the students with an image wall ! We eventually received the IBM Thinkpad as a reward for the IBM Linux Challenge. VideoLAN is one of the 25 winners of the IBM Linux Challenge for opensource projects developed by university students. The Thinkpad is a T23: Pentium 1.13 Ghz, 128 Mbit of RAM, 30 Gbit hard drive, DVD player, modem and Ethernet card. It was shipped with Windows XP...! Its name is Velix. It will be used by the developers of the Ecole Centrale to develop and test the solution and also for the events that we organise around VideoLAN. The team organized a conference to present the project and its possible applications to companies who could be interested in technical or commercial partnerships. It took place on February 28th 2002 at the École Centrale Paris. Thanks for those of you who joined the presentation. We were at the Linux Expo in La Defense (near Paris) from January 30th to February 1st to show the last achievements of our project: multicasting, advanced satellite decoding, real-time mpeg2 compression and streaming.